Prague Watchdog - Crisis in Chechnya - Don't bring the curtain down yet, gentlemen! Akhmed Zakayev’s agreement to take part in talks with the envoys of Ramzan Kadyrov (read the Kremlin) was received by some of his independence-backing supporters as an outright betrayal of their ideals. Journalists are writing about the fall of the last bastion of Ichkeria, and saying that Zakayev looks ridiculous when issuing orders to armies that exist solely in his imagination. On August 19, in an interview with Radio Svoboda’s North Caucasus service, Zakayev outlined the questions he had raised during the part of the talks with Dukvaha Abdurakhmanov that was held behind closed doors. Zakayev spoke of the need to search for the perpetrators of the killings of human rights workers, to return to their families the bodies of dead presidents and resistance fighters, to secure the release of the thousands of Chechens who are in prison, and to put an end to the persecution of the relatives of insurgents. These are the problems the London-based "prime minister" plans to discuss during the upcoming World Chechen Congress. Long ago, as Ichkerian Minister of Culture, Zakayev played the role of guardian of Ichkeria’s symbols – the only legacy of the Ichkerian state that could be retrieved from the territory seized by the occupiers. After being injured in a car accident in 2000 during the siege of Grozny, he did not have much option but to leave Chechnya. He was given the task of representing the interests of Ichkeria abroad, telling Western public opinion about the ongoing struggle, the atrocities committed by the Russian forces, and the abuses being carried out against civilians. In addition, with his background as a theatre actor, he played the role of public figure, demonstrating by the very fact of its existence that the independence of Chechnya was not subdued, not broken, that its ideas continued to live in exile. He helped those Chechens who continued to believe in the imminent liberation of their homeland to keep their spirits up. This was understood by almost all the former leaders of Chechnya. Even the radical and terrorist, Shamil Basayev, acknowledged the importance of Zakayev’s political activity. The resistance needed a man whose well-groomed beard suggested no link with the wild facial hair of the suicide bomber. And one must admit that Ahmed Zakayev role played his role very convincingly – above all, because he continued to be faithful to the ideals of his youth. He acquired that faith when, as an ordinary citizen of the rebel republic, he heard the first speeches of the leaders of an independent Chechnya as he stood in the crowds that gathered on the square in the centre of Grozny. He maintained it as he served in Dudayev’s government, and upheld it throughout the first Chechen war, when he personally visited the Chechen fighters in the hills and raised their morale. During the inter-war period he was almost the only sane person among the crowd of those who went crazy with victory and imagined they controlled the lives of Maskhadov’s ministers. While the Chechen politicians in Europe spent time in heated discussions about who had the most right to represent Ichkeria, who really loved Chechnya, and who merely traded in false sentiments, other Chechens became the executioners of their own people. In place of an imaginary homeland came a terrible reality consisting of prison, torture, murder, and the mockery and harassment of the insurgents’ families. It was easy, and even agreeable, for those politicians in Europe to portray themselves as the leaders of a non-existent state, accusing the European institutions of indifference and reluctance to interfere in internal Russian affairs. On the one hand, they continued what looked like an uncompromising struggle against the invaders, while on the other they were not exposed to risk. 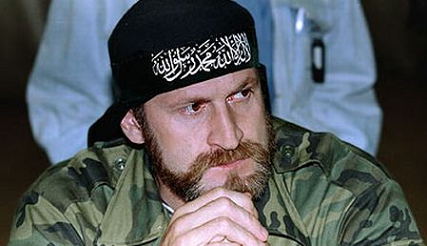 Of course, the Chechens in Europe are still fond of the symbols of Ichkeria, whose custodian Zakayev is. They like to wear shirts with the Ichkerian flag, at home they have posters on the wall with pictures of wolves, and they exchange similar images with one another by e-mail. If Kadyrov is also interested in Ichkerian symbols and would maybe like to purchase a couple of flags, if his regime wants to present its case in such a way that the talk turns to reconciliation with the separatists, and is willing in return to let Zakayev help in resolving the republic’s internal problems, then Allah be praised! If even one person is freed from prison by means of negotiations and Kadyrov’s vanity, if even one father and one mother receive the body of their murdered son for burial, I think that alone would serve as justification for all of Akhmed Zakayev's present actions. I just very much hope that his principal role is still ahead of him. Photo: Institute of Religion and Policy.